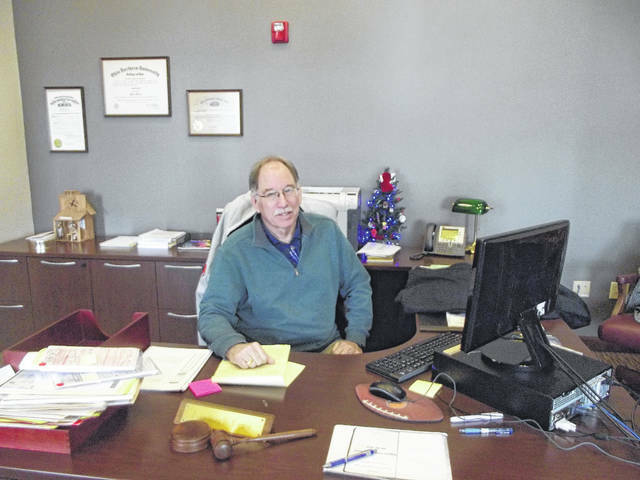 Auglaize County Municipal Court Judge Gary Herman sits behind his desk for a final time Friday, Dec. 29. After 36 years on the bench, Herman retired at the end of 2017. 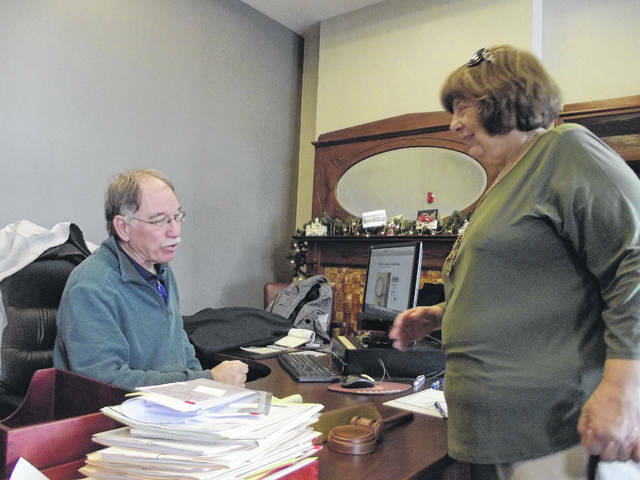 Auglaize County Municipal Court Judge and Sally Imondi, Auglaize County probation officer, talk Friday, Dec. 29, on Herman’s last day in office. WAPAKONETA — For 36 years, Gary Herman has donned his judicial robe and prepared for his daily schedule as the Auglaize County Municipal Court judge. On Friday, Dec. 29, he put his robe on for the final time. He heard cases in his courtroom and watched his successor, R. Andrew Augsburger, receive the oath of office as the new judge for the county. Herman said he didn’t do any door-to-door campaigning for his first election. His opponent in the first election, Herman, recalled, was a member of the Cridersville Fire Department. Herman and his family were way back in the parade route, he said. “My brother, his wife and in-laws were all there. The kids were dressed in Halloween costumes. I had a trunk full of yard signs and the kids carried them in the parade. Other kids (not related to Herman) decided they wanted to carry signs too. There were probably 40 kids carrying signs. That simple approach worked and Herman carried Cridersville in the election. He said the knowledge he gained from Clerk of Courts Wanda Kogge, Auditor Vernon Doenges and Sheriff Jim Knoch was invaluable. Herman said he has seen many changes in the courtroom. There have been amendments to the driving while intoxicated law. When he first started, there was no domestic violence law. Today there’s a law in place. “The lasers the police measure speeds of vehicles have changed also,” said Herman. Herman said he has seen many people walk into his courtroom: from law enforcement to attorneys to victims of crime. “Individuals have problems with many issues. I let them have their voice before I did something,” said Herman. Herman said he used the restricted plates when a person appeared in his court on DWI or DUI charges. He said Auglaize County probably has more restricted plates in use than any other county in Ohio. When judges were given the option of installing a Breathalyzer in a vehicle, Herman had one installed in his vehicle. “I used it for two months to see how it worked and how it functioned on a vehicle. One guy begged me for it because he knew that was the only way he was going to get driving privileges,” said Herman. The most complicated case Herman ever heard should have been a simple case. When the group disbanded, the teen was going to take all the props and equipment with her. The mothers objected, saying they raised the money for the purchase of the tiaras, T-shirts and other items. The case ended up in small claims court, said Herman. There were no attorneys involved in the case. “I determined that the baton corps was an unincorporated association,” said Herman. “I decided each girl should receive a T-shirt, tiara and baton. The girls who stayed with the teacher had the right name on their T-shirts. The girls who left, didn’t. “The case is one that law school would do with corporate associations and you’d have to write a blue book on it,” he said. The most difficult cases, he said, deal with unrepresented defendants who are members of patriot groups. “They believe the court has no legitimacy,” said Herman. “They believe the government is not legal and believe they have no authority over them. “I once had a kid sit in jail for a week. He wouldn’t enter a plea. He wouldn’t get a driver’s license. His family wouldn’t bond him out. He had skipped from Celina on the same charge,” said Herman. With his retirement underway, Herman said he looking forward to doing more traveling. He recently visited England and Ireland and plans to go back to his mother’s roots in Ireland. He’ll also be spending part of the year at the family’s cottage at Middle Bass where he’ll be fishing, continue making wine and create stained glass. He also plans spending time with his family which includes his siblings and lots of nieces and nephews and four goddaughters. “I’m going to miss the people I work with,” said Herman. “Grace Copeland has been here with me at the office more than she’s been with her husband in the last 20 years. His last act before leaving his office Friday was one his dad performed when he retired from medicine.